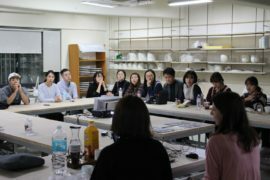 I was invited by the ceramics department of Seoul University to give a lecture to all the year groups of both undergraduate and masters courses. 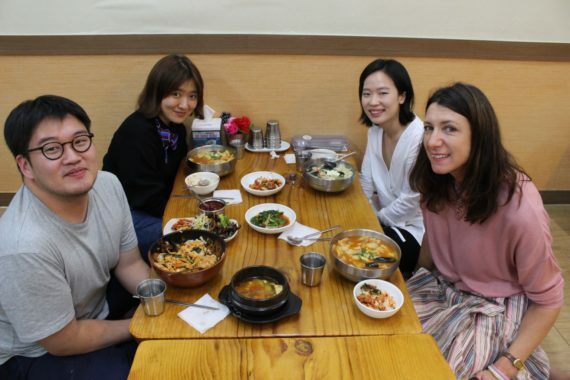 This was something that had been in the diary for months, organised by Kyung Won as she is an alumnus. 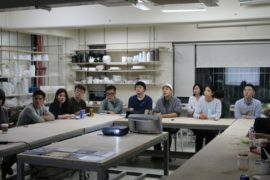 It seems the two best ceramics courses in Korea are at Seoul and Hong-Ik Universities. Seoul is very focused on porcelain, tending towards functional ware and I believe Hong-Ik leans more towards sculptural work. I was actually supposed to give a lecture at Hong-Ik as well, however at the last minute they announced they could not pay me, having previously offered an amount, and they were also fairly demanding in what they wanted from me, so in the end I decided one well paid lecture was enough! As it happened, I ended up spending the best part of two days preparing for it whilst here, because I had simply had no time prior to leaving the UK. It was fantastic to be able to draw on so many films that have been made by Tela Films for me over the past few years – film works very well in this context and actually received applause at the end of each clip! The reason the preparation took so long was because I ended up writing out the whole talk so that Kyung Won would be able to easily translate. 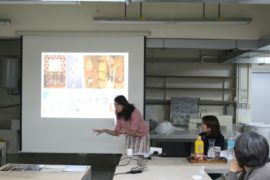 I was not keen on presenting in this way; I feel much more confident and able to flow by just standing up and talking. Reading, or trying to follow a script, is really not natural for me. It was also unusual to give a talk that had to be translated. Next time I need to factor in the time the translating takes! But it was very well received and it was a pleasure to be invited. I particularly liked the fact that they transformed one of the main clay studios for the talk by rearranging the seating and pulling down a screen. 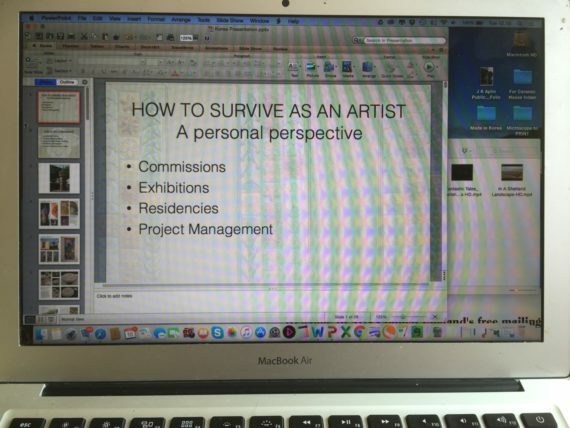 It felt comfortable and familiar to be giving a lecture in a ceramics studio. 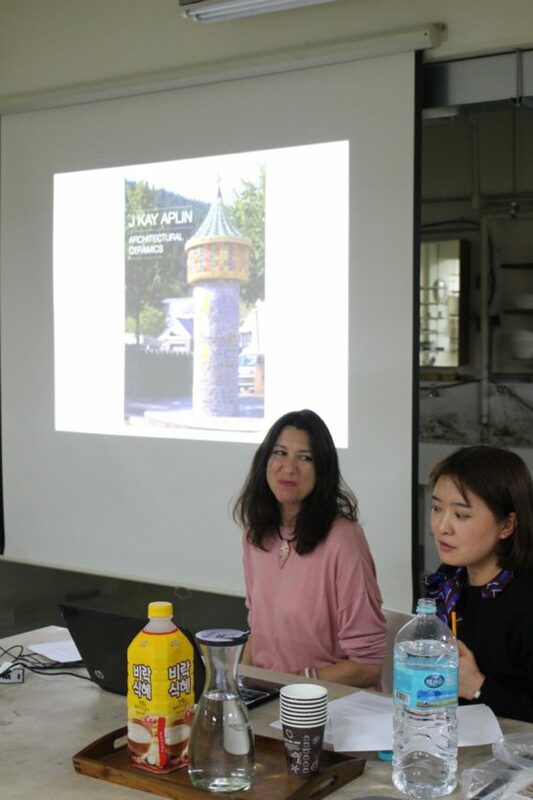 It was nice that three of the exhibiting artists in Made in Korea were present at the talk. Jae Jun Lee, who I met at Collect (he was exhibiting with Gallery LVS) and who subsequently came to stay at The Ceramic House, works at the University in the ceramics department and Bo Kyung Kim is visiting Seoul from Germany where she is currently studying, in addition to Kyung Won Baek of course. 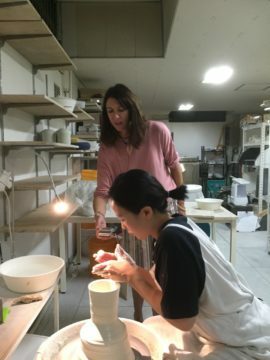 After the lecture all four of us went out for dinner and then back to Kyung Won’s studio, a very well equipped space for porcelain. 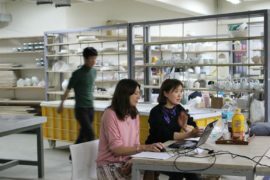 It turns out that the studio was set up about 10 years ago by a group of graduates from Seoul University, who formed a collective, pooling resources to buy equipment in a rented space. The way it works is that a prospective member can buy into the studio, and if they leave they get their deposit back, and while they are there the rent is low. 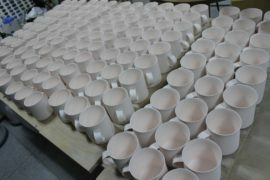 They supplement the studio income by renting space to amateur potters at weekends and occasionally instead of paying rent a member might buy new equipment. I tested out the sound recorder Joseph gave me for this trip. 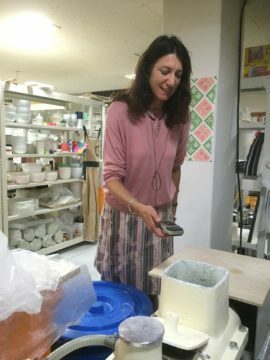 In lieu of his being here, I have been instructed to record the sounds of the ceramists working in their studios so that Joseph can use the sounds to create sound pieces for the exhibition. 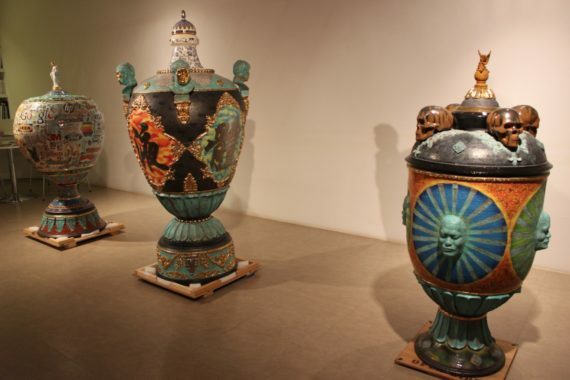 The idea is similar to a sound piece he made for the first ever exhibition at The Ceramic House in 2011. He was commissioned by HOUSE festival to create a piece called Base Sound :: Sonic Gold. He recorded the sounds of me making work in my studio and used them to make an I-pod piece. Visitors to the exhibition were offered to listen to the sounds of making while looking at the exhibits. I got the hang of the sound recorder I think! And I also filmed Kyung Won and Bo Kyung working for the eventual film that will be made about the whole project. The trouble about trying to keep a blog while there are lots of exciting things going on, is that there is no time to actually blog! I am sure this sentiment is shared with everyone else on this site. There has been so much going on in Seoul over the past few days that I have not any time to update – and in about one minute I am leaving for Seoul train station to catch a train to Gimhae, where I have had a special invitation to visit ClayArch Gimhae, the biggest and most well respected centre for Korean ceramics and residency centre in Korea. This is the start of a 5 day trip in south Korea so I will hopefully find the time to chronicle my last few days while I am there. 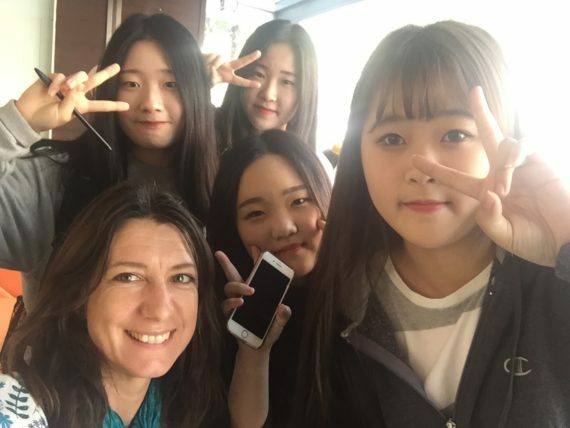 In the meantime, I will leave you with this photograph taken by four very cute and enthusiastic school students who interviewed me yesterday as a school assignment about what foreigners’ experiences of Korea are. Today’s appointment was with Eui Jeong Yoo; a visit to his solo show that ends today, hence the haste to make sure we didn’t miss it. 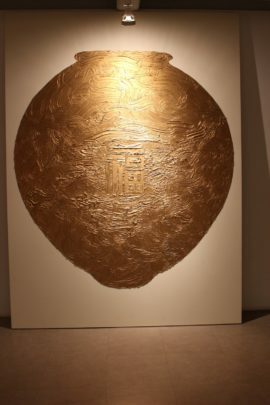 Won has been impressively efficient and thorough organizing a schedule that includes meeting up with each Seoul-based Korean artist, either at their studio or exhibition. We met after she had taken her own show down and set off for Gallery Purple, just outside of Seoul in a town called Namyangju. 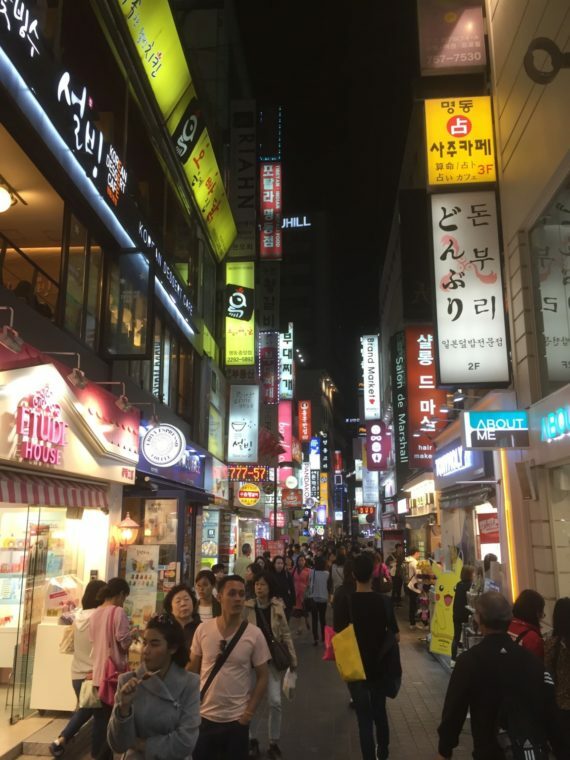 It was refreshing to be surrounded by fields of corn and mountains, but even here, where you would not expect to find sophistication, there were several very trendy cafes and the Gallery Purple complex. What a place! 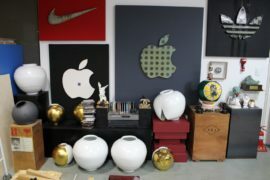 I discovered that it is a philanthropic enterprise, owned by a couple who are collectors. 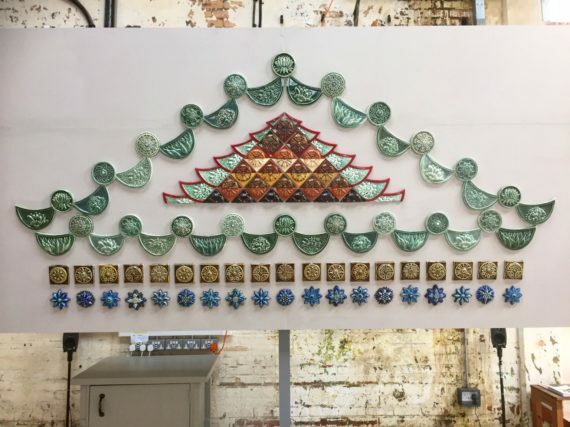 They have established a model whereby they invite artists to do residencies in a fantastic purpose-built space, with spacious studios and a very well appointed gallery, and in exchange they receive artwork for their collection. This kind of thing does not happen in the UK! But it should! It is a well-trodden path in the US, but then there is not much public funding there. Anyway, it was a treat. 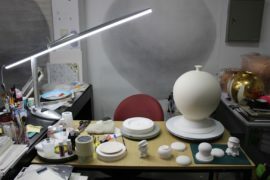 Eui Jeong Yoo caught my attention because his work fits the Made in Korea theme very well. 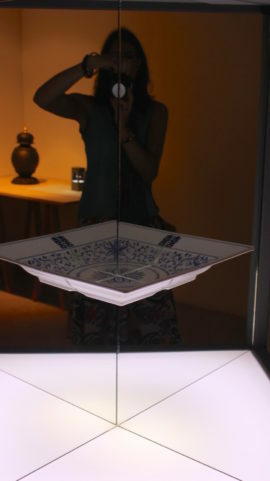 My idea behind the theme is that is questions identity and provenance and values of the mass-made versus the hand-made. 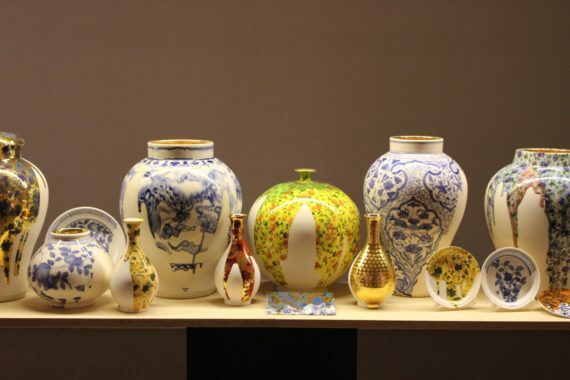 Made in Korea is something one sees stamped on the bottom on mass-produced goods a lot, whereas the standard of craft, and in particular, ceramics, from Korea is exceptionally high (in my opinion). 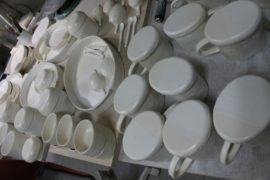 Therefore to give a ceramic show of high quality the name Made in Korea is a little ambiguous. 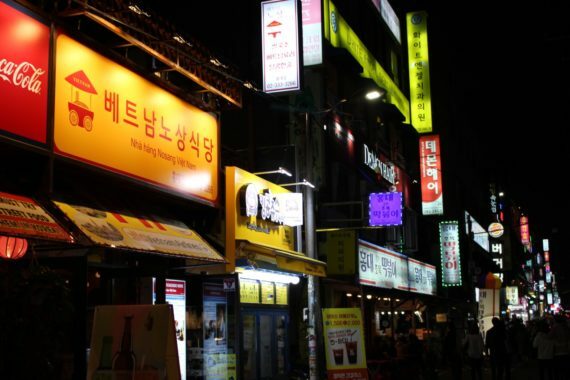 In addition, all the artwork is made by Koreans, but not all of them reside in Korea. Anyway. I digress! 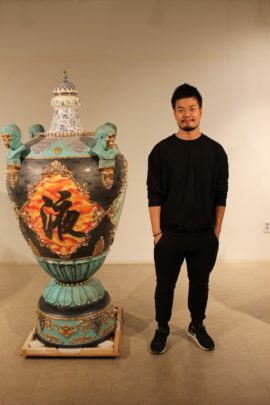 The reason I was drawn to Eui Jeong’s work is because he refers to the traditions of Korean ceramics by re-creating classic forms, such as moon jars and vases, and he sometimes mixes the traditional designs, such as cranes and clouds, with contemporary highly commercial brands. 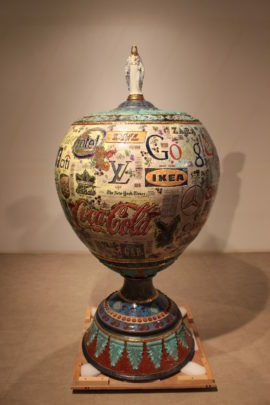 So he is questioning various things – what is fine art in relation to craft and how famous brands acquire new significance through mass populism. His solo show was stunning. The first thing we encountered were three man-sized vessels. Wow. The first thing that came into my head was, he must have had access to a BIG kiln! 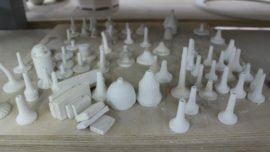 It turns out he made them at ClayArch Gimhae, the Ceramic Collection and Residency Centre who have made me a special invitation to visit. 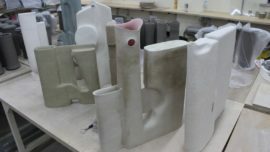 It is a centre for architectural ceramics, hence why I am interested as that is my specialism! 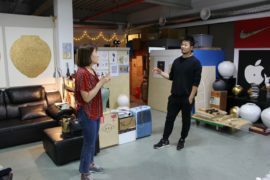 Afterwards Eui Jeong invited us into his studio and we chatted about his work and the practicalities of the exhibition in the UK. He then gave us a lift back towards the city, while light mist descended over the mountains surrounding us. 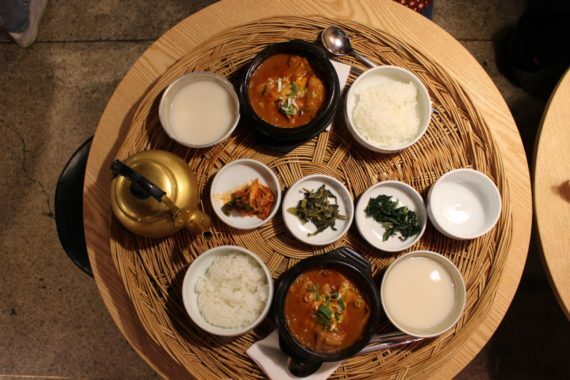 We stopped off for another spectacular Korean speciality for dinner in Hongdae again (even buzzier as it was Saturday). We had a spicy chicken soup with red peppers. Yum!